For Comedy Week, we're running a handful of tributes in the vein of our Dead Wrestler of the Week series. Here, Alexander Woo, a writer and co-executive producer for HBO's True Blood, eulogizes Vaughn Meader, the wildly popular JFK impersonator whose star plummeted after the assassination of his subject. He died in 2004. Speak slowly, and ask if the name Vaughn Meader means anything. The comedian of that certain age will meet your question with a slump of the shoulders, a hollowing of the eyes, and a pained, possibly vocalized exhale as if in response to a very, very slow gut punch. The story of Vaughn Meader preys on the comedian's greatest fear — factors out of your control conspire to destroy you and everything you've accomplished. Below that age, among comedians and otherwise, the name Vaughn Meader is a cipher, an empty signifier, or at the very most a tip-of-the tongue allusion to either a jazz saxophonist (Von Freeman) or an obscure Red Sox pitcher (Vaughn Eshelman). In the early '60s, Meader was a piano-playing nightclub entertainer in New York City whose act can roughly be imagined as a slightly blue version of Weird Al Yankovic. His one sure-fire crowd pleaser, however, didn't involve the piano at all — Meader refashioned his native downeaster Maine accent into an impersonation of John F. Kennedy so iconic that Rich Little's JFK impression and The Simpsons' Mayor Quimby can both be traced back to Meader rather than Kennedy himself.And that, essentially, is all you need to know. Among those who remember, Vaughn Meader was one of the most famous names in America for a 12-month period from 1962-1963. After that, his cultural significance evaporated almost overnight, his name thoroughly erased from public consciousness to the point of sub-trivia. To get from there to here requires a bit of doing, and a lot of bad luck. And that's why, in an industry overrun with one-hit-wonders and flashes in the pan, Vaughn Meader may still be the single biggest crash-and-burn story in the history of showbiz. 1.) Imagine in your mind the voice of JFK. 2.) Go to YouTube and watch a clip of John F. Kennedy, then a clip of Vaughn Meader. If you weren't around in the early '60s, you may be surprised which one is closer to your memory of JFK's voice. Meader soon jettisoned the piano in favor of a full-on impressionist act. His signature bit was a mock press conference wherein audience members (and sometimes ringers) would ask a question of the president, and Meader would improvise an answer. (A particularly good one: "What do you think of Red China?" "It doesn't go with the blue drapes.") This qualifies as daring stuff for 1962. During World War II, Franklin Roosevelt banned impersonations of the president over the radio for fear of the chaos that might ensue if faux-FDRs ran amok over the airwaves. From that point on, few comedians tried to impersonate a sitting President, so a JFK act, and an improvised one at that, drew its share of attention. From there, Meader collaborated with writer/producers Bob Booker and Earle Doud to create an album of JFK skits called The First Family. Recorded on the night of JFK's Cuban Missile crisis speech, the album propelled Vaughn Meader from nightclub drudge to overnight national sensation. The First Family reportedly sold 6.5 million copies in its first six weeks, obliterating all previous standards for recording success. The material is tame by today's standards; the predominant joke portrays the Kennedys as an absurdly ordinary American family, as fixated with the mundanities of meting out bath toys as with handling Khrushchev. Even at the time, the record was considered affectionate rather than scandalous, and the president himself supposedly played it before a cabinet meeting. As with so many fads, The First Family was the perfect gimmick at the perfect time — a nation infatuated with a young, attractive family in the White House devoured the lampoon. A second album soon followed, along with numerous television appearances, a Grammy Award, and a concert at Carnegie Hall. By Meader's own estimation, from 1962-1963 his impression of JFK was heard on the radio more often than the actual president's voice. Examine those YouTube clips for the moments when Vaughn Meader is speaking as himself. He's awkward, stammering, more uncomfortable in his own skin than most any comedian you can think of. It's puzzling, poignant, and instantly forgotten the moment he starts doing JFK. Suddenly he's confident, engaging, charismatic. Presidential. It's as though he's channeling Kennedy. This to me is the most fascinating thing about the Vaughn Meader story: The mere fact of John F. Kennedy transformed him from a nightclub piano man (not even a comedian!) into a stratospheric success beyond his imagination or aspiration. Meader liked to tell the story that at the height of his fame, Frank Sinatra asked him to join the Rat Pack, but that he declined because he didn't want to be limited to Las Vegas. You know how it ends. An oft-told anecdote (and the where-were-you-when-Kennedy-was-shot story to top them all) involves an oblivious Vaughn Meader slipping into a taxi cab at the Milwaukee airport at 1 p.m. on November 22, 1963. The taxi driver, recognizing Meader, asked him, "Did you hear about Kennedy in Dallas?" Meader, accustomed to fans pitching him jokes, gamely replied, "No, how does it go?" 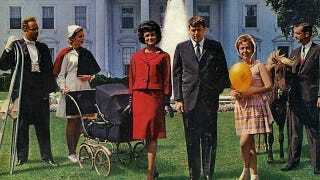 The success that was built out the fact of John Kennedy's very existence crumbled the instant the president died. Meader quickly and wisely retired his JFK impression. Booker burned all existing copies of the two First Family albums. And Lenny Bruce provided the perfect epitaph by opening his first performance after the Kennedy assassination with the line, "Man, is Vaughn Meader fucked!" The crowd reportedly exploded with laughter. If you want to see a shell of a man fighting for his career, bombing spectacularly on national television, not because his material is weak, but because his audience pities him—if that's truly something you want to see, find a tape of Vaughn Meader's performance on The Ed Sullivan Show in early 1964. Meader for the past several months had been showbiz Kryptonite, a walking reminder of the greatest national tragedy since the Second World War. Not only did no one want to see him do Kennedy anymore—no one wanted to see him. Sullivan kept a promise to have him on the show in '64, but the cause was hopeless. No one wanted to laugh, not with Vaughn Meader. So here he was, a dead man talking, met only occasionally with a polite chuckle to pierce the silence. It was the last time he would appear on national TV. In the end, the story of Vaughn Meader is in many ways the perfect distillation of what John F. Kennedy meant to the country. Kennedy's ascension inspired an unexceptional nightclub performer to reach exceptional heights, and Kennedy's demise erased it all just as quickly. Vaughn Meader lived on as a biological entity, but his life played out in a series of increasingly bizarre and sordid phases that speak to the trauma of having his career assassinated in 1963. He recorded an album called The Second Coming as a sort of hipster Jesus, and his friends at the time recall that for a good part of the late '60s, he truly believed he was Jesus. There was also a cameo as Reverend Oral Sacrifice in the movie Linda Lovelace for President. Sometime after that, he reclaimed his given first name, Abbott, and buried Vaughn Meader more or less for good. Abbott Meader was a honky-tonk piano player (certainly not a comedian), fond of the Kentucky Derby and his collection of blue bunny toys. Though he didn't deny the existence of Vaughn Meader the JFK impersonator, neither did he admit it was a significant time in his life. After all, Vaughn Meader was dead, cut down by the same bullet that killed Kennedy. Abbott Meader lived for another 40 years, the last 16 in the loving company of his fourth wife Sheila, finally settling back home in his native Maine. And yet, when I called him in his home in 2003, a year before his death, Abbott Meader was ready for his comeback. He had sold the movie rights to his story years earlier, which helped to defray some of his medical costs. Though I didn't know it at the time, he was bedridden and breathing with the aid of an oxygen tank. I informed Meader that I was interested in writing a screenplay about his life and asked if he would be willing to talk. "All right," he said. "Let's get some action on this!" Alexander Woo is a writer and co-executive producer for the HBO series True Blood, and the author of a screen adaptation of the life of Abbott Vaughn Meader entitled My Assassination.